In brief: Good in groups because there is always room and its fun to share. Not cheap but truly good southern comfort foods and BBQ. Most of Thursday and into Friday morning we didn't have heat in the building so what was supposed to be a working lunch in the office with our client/friends turned into leaving for a heated restaurant because my fingers and toes had almost frozen through. M. and I need a category of lunch options labeled "good for large parties and spreading out architectural plans". 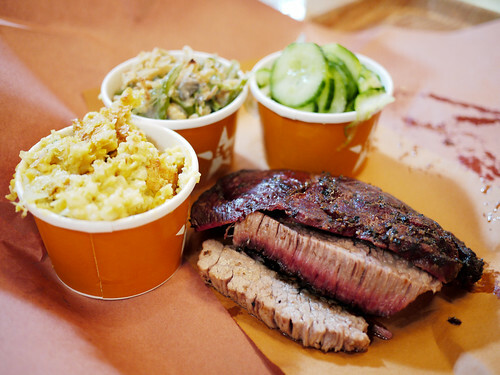 Hill Country sort of worked, it's spacious enough for a working lunch, but the moist brisket on butcher paper makes for a messy surface afterward. Still, we manage quite nicely.